Next week is the LinuxCon Europe in Düsseldorf, Germany. 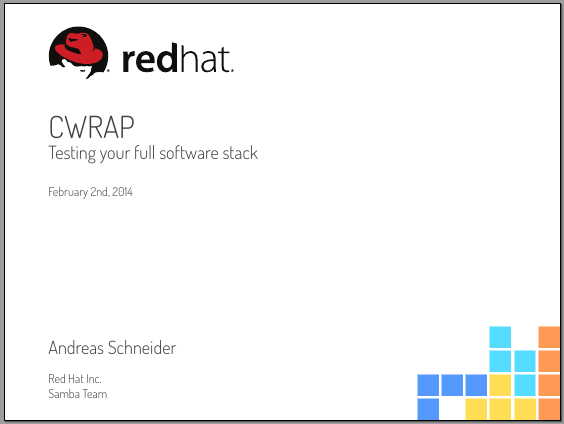 I will be there and give a talk about cwrap, a set of tools to make client/server testing easy on a single machine. Testing network applications correctly is hard. This talk will demonstrate how to create a fully isolated network environment for client and server testing on a single host, complete with synthetic account information, hostname resolution, and privilege separation. I hope you will attend my talk if you are there. If you can’t attend the LinuxCon Europe, but you’re going to the Linux Plumbers Conference then say hello and lets talk about cwrap there!